Be sure to review the condition of your propane tank as well as its date of manufacture. 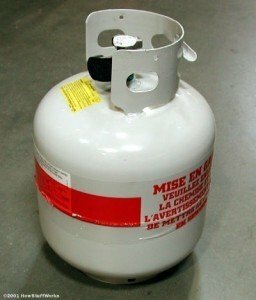 For safety, always keep propane tanks in their upright position and they should only be transported & stored in a well ventilated area. Be sure to always close and cap the valve. NEVER leave a tank in a hot environment. You may want to purchase a milk crate to help stabilize the tank when it is not being used. Damaged tanks and expired tanks can not be refilled. Look them over for any dents, gouges corrosion, rust or bulges. Propane tanks only have a useful life of twelve years before they need to be replaced or re-certified. Be sure to check the manufactured date located on the collar of the tank. Any tanks that were made 12 years prior to this current month can no longer be filled. Respecting the properties and dangers of propane fuel will lead to the safe use and handling of it. Enjoy the summer but play it safe when transporting and cooking with propane.